The designer brand's new collection expresses all our inner thoughts. It's official: Viktor & Rolf truly gets us. The fashion house just sent the most expressive collection of dresses down the runway at Paris Fashion Week on Wednesday and we can't stop staring. 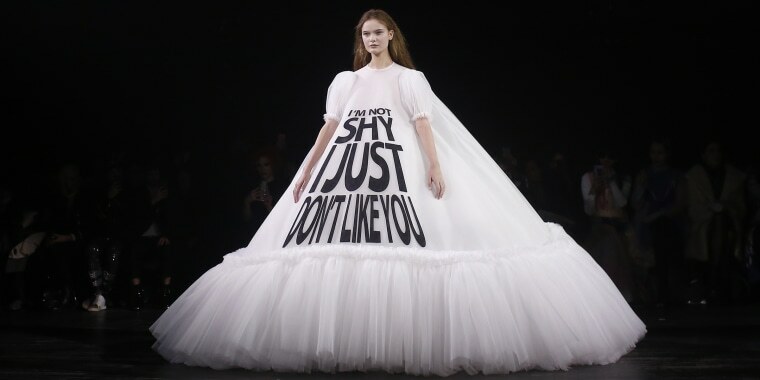 The sassy Spring/Summer 2019 collection certainly gives new meaning to the phrase "wear your heart on your sleeve," and features a slew of meme-worthy poofy tulle gowns. The daring dresses are each unique in their own way, but they've got one major thing in common: they all feature brutally honest messages. From snarky phrases like "I'm not shy, I just don't like you" to "Leave me alone," these couture masterpieces certainly speak for themselves. Basically, Viktor & Rolf designers have created statement gowns for all of your inner sarcastic thoughts. And all of those witty quips that often come to your mind. This model spoke to our inner homebody with a ruffled purple dress that read "Sorry I'm late, I didn't want to come." While this green gown stole the show with a message that read, "I am my own muse." Some models strutted down the runway in gowns with pretty optimistic messages like, "I want a better world." Or ironic phrases like, "Trust me, I'm a liar." Social media users are definitely having a fun time with these statement makers on Twitter. And many people are feeling pretty inspired by the bold looks. We're not surprised the new collection resonates with so many Twitter users. Our only problem now is deciding which one of these dresses is our favorite!